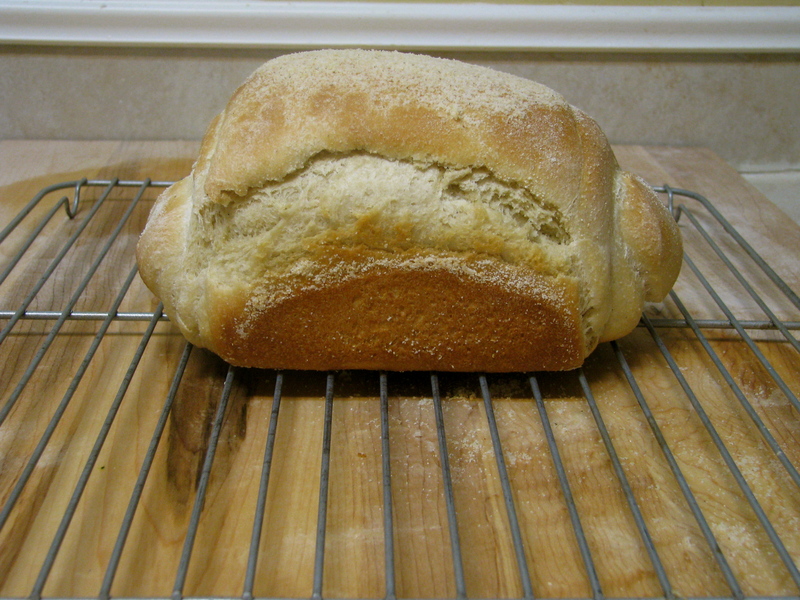 Not to ignore my roots, this week I went for a New England Classic: Anadama Bread. According to legend a man was upset when his wife left him. When looking around the kitchen for something to eat after the tragic abandonment, all he found was some cornmeal and molasses. With this he cursed, “Ana! Damn her!” and proceeded to make some bread. When life gives you cornmeal… make bread! Well, I happened to forget to buy molasses and being that I am nowhere near a grocery I made do. Adapted from Peter Reinhart’s recipe. The night before making the bread take 1 cup of coarse ground cornmeal and 1 cup of water, mix it up, cover it in plastic and let sit out on the counter overnight. 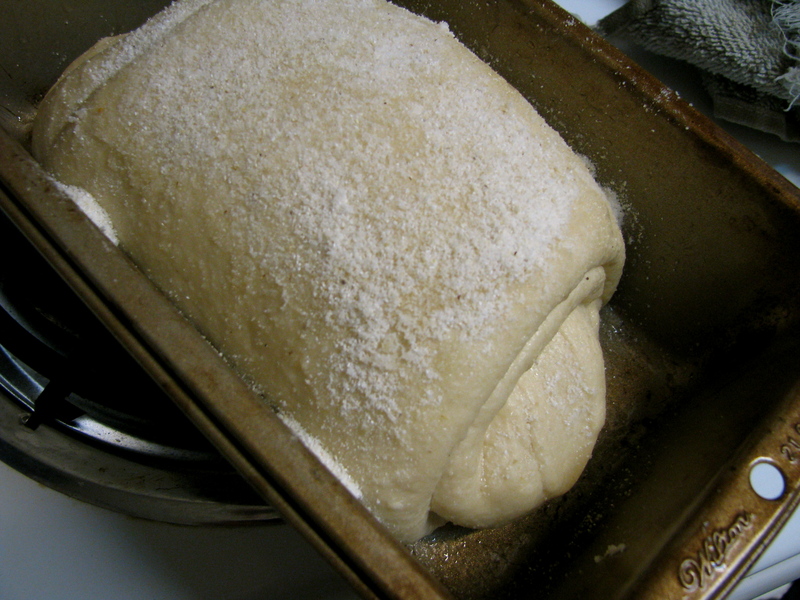 The next day, take 2 cups of bread flour (I used half all-purpose and half bread flour), 3 tbs. dark corn syrup, 3 tbs. 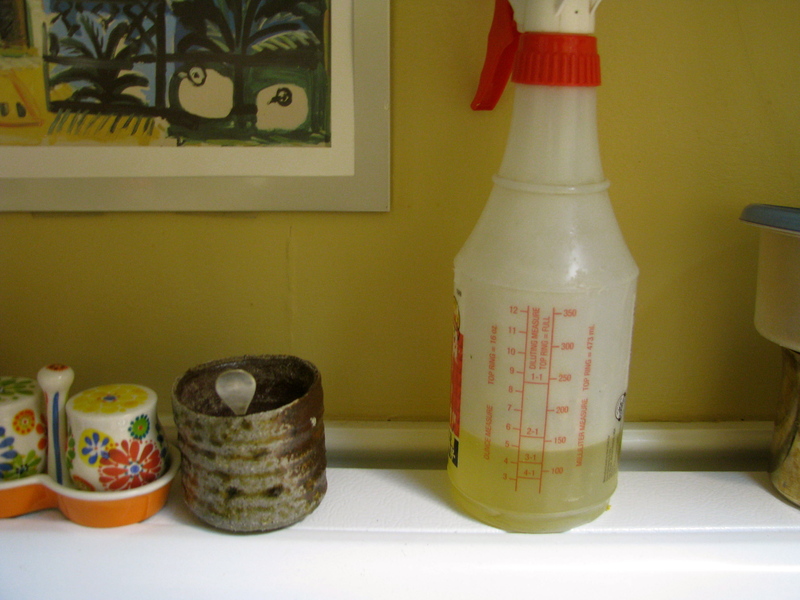 agave nectar (or omit both sugary ingredients and use the original instructions of 6 tbs. molasses), 1.5 tsp. salt, 2 tsp. 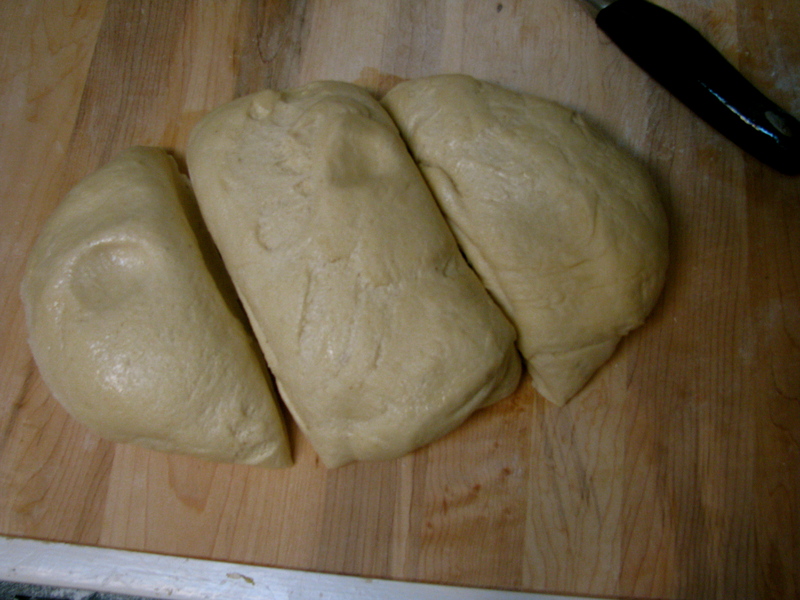 instant yeast, 1 cup of water, and the soaked cornmeal. Let it ferment for about an hour until it starts to bubble a little. Next up add 2.5 more cups of flour (again I used a mixture of bread and all-purpose), and 2 tbs. softened but not melted butter. Start kneading. And kneading and kneading. And keep kneading. Really go at it I learned. You need to give the gluten a good workout. You will know when it is done when it passes the window pane test. According to Reinhart, if you cut off a small chunk of dough and begin stretching it gently from all sides until it is as thin as paper and you can see right through it, you are done. If the dough tears before this point, keep at it. This step took me a good 20 minutes, but I am an amateur. 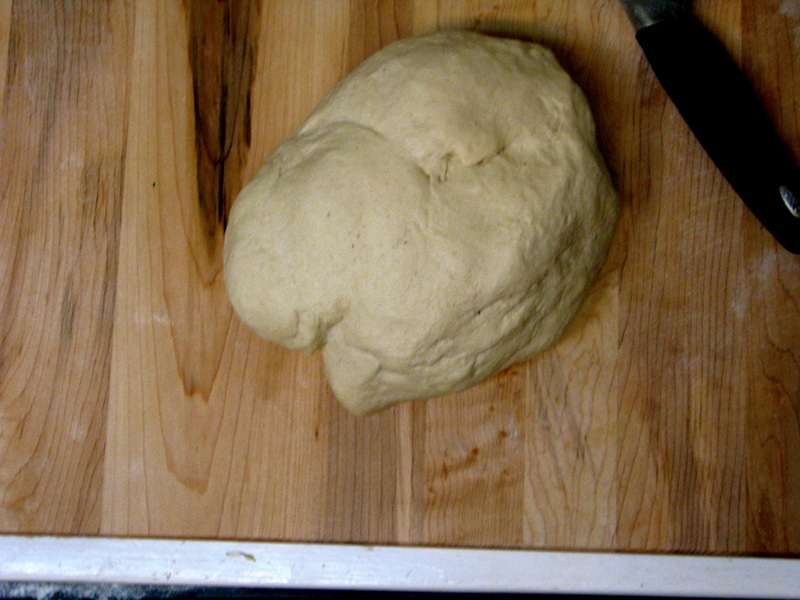 I was flailing that dough around like a baseball bat against my cutting board. I was pounding it with my fists. I was smashing it in half and then in half again. In general I was just having a good old-time. 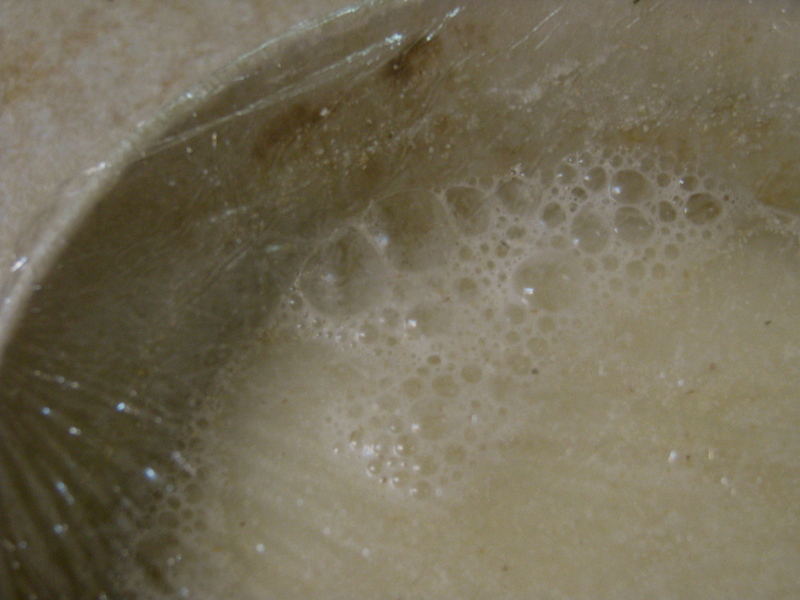 Grease up a bowl with olive oil, flip the dough around in it two or three times and cover with a towel. I always proof my dough in a slightly warmed oven (about 80F) or the microwave. If you are lucky enough to have old-fashioned radiators in your home, this is how I remember it being done when I was a little girl. I would park myself right down next to that rising beauty and warm my buns in the same manner. After about an hour and a half your dough should be double in size. Divide it into 3 pieces. Flatten it out just a bit, into the shape of a rectangle. Fold one half towards the middle then seal the top part over so you have a tight little log. 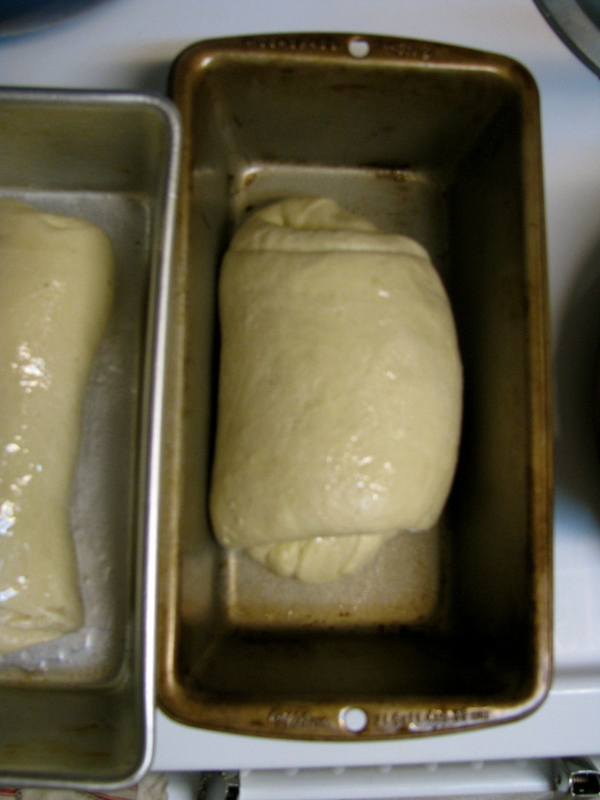 Put each piece into an oiled bread pan and cover with a towel once again. At this point I put two of the loaves covered in plastic into the fridge. I will take them out and proof them (about 4 hours) before baking within the next two days. Homemade bread all week. Lucky us. After 60-90 minutes your current loaf should be ready for the final step. Preheat the oven to 350F and spray on some olive oil. I keep some handy in a squirt bottle. Sprinkle on some cornmeal and pop her in. Bake for 40 minutes or until you feel that hollow knock. Or just use your thermometer. Your looking for about 190F. I think my sister-in-law should give this bread a whirl. I would love to eat a slice and announce, “Ana. Dama that is good.” Because really and truly, it is just that. This entry was posted in the year of bread. Bookmark the permalink. I was going to say I remember it being darker growing up- but then I remembered you forgot the molasses.. Looks delish.. You are now officially my bread guru- so I’ll try it this week or next. well when you do, i just baked the second loaf (one of the ones that was cold proofing in the fridge) and it was nothing like the first. It was still good but more sponge-y. Almost like focaccia. anyways, glad you like making bread!